Spring is coming…right?! Please tell me spring is coming! It might not feel like it, but we’re almost into spring building season. Soon the ground will thaw and our favorite local builders will be digging spots around Grand Forks to build dream homes. Building a home can be such an exciting time, but it can also be overwhelming. There are a lot of decisions to make, options to consider and people to coordinate. One of the most fun decisions (at least in our opinion) is choosing your lighting. Lighting can be a great way to show off your own unique style, while still being functional for how you plan on using your new space. People often believe that they should only begin looking at lighting at the end of the building process, right before they need to install it, but we encourage you to engage a lighting designer much earlier in the building process. Today, we want to share how a lighting designer can help simplify your building process, while optimizing your lighting budget. Before the ground is even broken, our lighting designers will sit down with you to determine a lighting plan based on your blueprints. Starting this early in the process will help you determine outlet placement, ceiling wiring, and circuit needs, which will make your electricians job easier. Our lighting designers often do a walk-thru with a contractor’s electrician to ensure they understand the electrical needs for the home and it’s lighting. Based on the blueprint lighting design, we will consult with the electrician on the best way to bring your lighting dreams to life, plus, ensure that nothing gets missed in the electrical process. Having the right lighting in your home is not only aesthetically pleasing, but it can make a huge difference in how you use different spaces throughout your home. For example, in the kitchen, you may want overhead pendants that provide enough lighting for your island, but you also may want under cabinet lighting that optimizes the counter-space under the cabinets. Along your stairs, you may want footlights that stay on all night and act as both a night-light for the middle-of-the-night trips to the bathroom and a safety mechanism so no one trips going up and down the stairs. 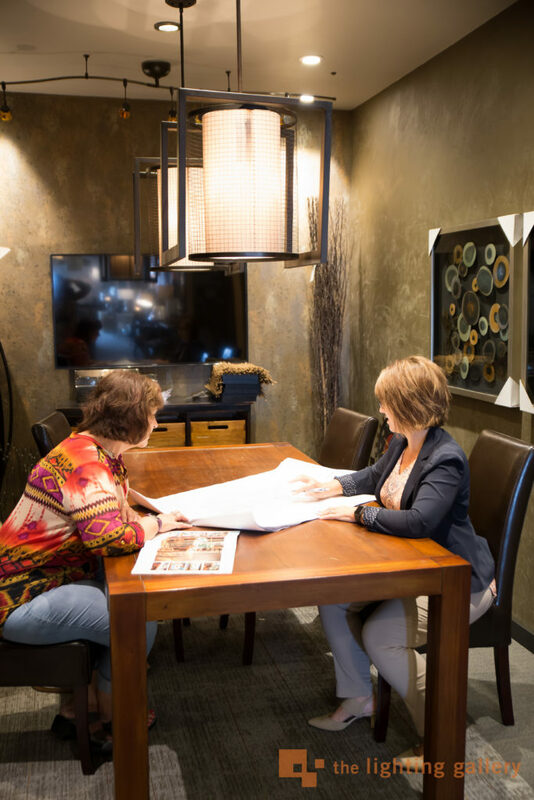 Functionality is one of the most important factors to consider when lighting your house and working with a designer means you’ll get advice and guidance regarding your functionality rather than just a transaction at the big box stores. This is the most fun part of the process! This is where we get to dream, imagine and explore. Based on your style, budget and desired functionality, we will find lighting options that fit your unique lighting tastes. Some of the fixtures we may have hanging in our showroom, some we may find as we page through the catalogs and others you may find as inspiration as your scroll through Houzz as you fall asleep at night. We promise to do all the leg work and put together a plan that fits your style and budget. Smart home options are starting to add real value to simplifying and enhancing people’s lives. Explore smart home options and how your family might be able to use this technology. For example, if you vacation regularly, you may want to use smart home options to turn your lights on and off at different times during the day so people assume you’re at home. Also, new lighting technology systems allow you to control your entire home lighting system from an iPad or even your phone. If you’re not sure what options are available and affordable, we’d love to help you through the process. We have many smart home automation options from bulbs to switches to entire home automation systems. Our clients tell us the number one benefit of working with The Lighting Gallery is the service after the sale. Unlike the big-box store, we stand behind each of our products and work with you after the sale to ensure you’re happy with how your lighting experience turned out. We have long-standing relationships with our clients (and their contractors) that begins and ends with service. The overall consultative process that we provide during your home building experience is something that you won’t find at the big box stores. Plus, our service after the sale and commitment to backing our product is second to none. The best part is – it’s all part of our free consultation. You won’t pay any extra for us to walk through the whole process with you and plan – plus, we’ll have fun doing it! Schedule your blueprint lighting consultation with one of our lighting designers!